As the first wave started, Women 39 and under, were still trying to figure out if we should do the first or last wave. 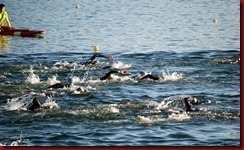 The race director suggested we do the last wave. Daddy tells us to go now so that the time is most accurate. Mommy and I start swimming even though we are behind a little. I feel great but it’s kind of hard to swim with my shortie wetsuit on. It feels like it’s pulling on my arms but it does not hurt. We keep swimming and we see kayaks. I watch my mom underwater so I don’t get lost from her because I love her and we are doing this together. Finally we get to the first yellow buoy. I’m so happy because I feel great. I’ve been able to swim freestyle most of the way. We turn and I feel fine and the water is warm. Halfway to the next buoy, I think I see a small fish. I start getting scared of what is under the water because it’s hard to see. Finally we get to the buoy and I’m not scared. We turn and head for shore. I’m feeling okay. We see people fishing on the side and I don’t think they are going to catch much fish because we are scaring them all away. I also see a boat parked on the side. I start seeing seaweed on the ground and the ground again. We are almost there. Finally we get to the finish of the swim. I start to run up the ramp, unzip my wetsuit and pull it down halfway. I keep running to my bike. I get to my bike and take my wetsuit off. 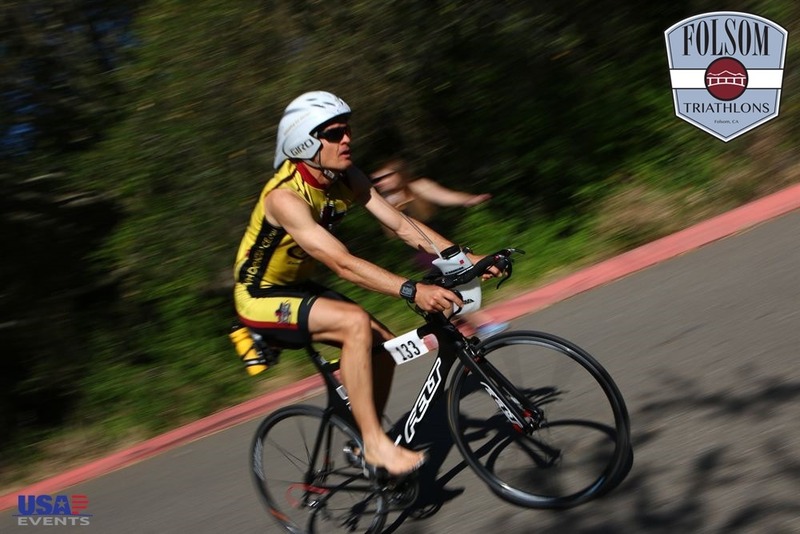 I put on my shorts, shoes, race number, helmet and glasses. I take my bike and run out. Mom is right behind me. I get on my bike and starting going up a hill out of the park. I pass some people. We get onto the road and I stay to the right while Mom bikes behind me. People pass me. One girl passes me but I pass her back. My watch beeps for the first mile. We go a little farther and we turn right. We bike down a short road and turn left. I see black smoke ahead and I tell my mom that I think there is a fire. As we get closer and closer to the black smoke it starts to turn white. The fire must almost be out. We keep biking and up ahead we see a lot of bikers huddled up. As we get closer and closer, the bikers start going again. We have to go the left side of the road to pass the fire truck. When I go past the truck, I smell smoke even though the fire is out. It was a car that was on fire. But, it was all burnt except for a little bit in the front. So it really was a fire! Too bad for the people ahead that had to stop! We keep on biking and turn right. We bike and bike and bike. There is a small but steep hill. That’s where I pass some more people. Then it was a downhill. It feels great going down! We turn again, bike a little bit more and turn once more. Up ahead I can see the turn to the park/transition. When we get into the park, we have to get off our bikes at the dismount line. We run our bikes in. I run past my bike rack on accident. I cut through some dirt to get back to my spot. I take off my helmet and glasses and put on my running hat. We run out of transition and I hit my watch to start. We both have to go to the restroom so we quickly go. We then are off on our run! I love running! We are side by side. We run on the dirt, then on pavement and then back on dirt in a bike park. I was about to run one of the jumps there but I realized that was not part of the course. Too bad! We come to an aid station and my mom tells me to walk and drink. That’s the first mile. Then we keep running and there is another aid station already! We don’t grab anything because the course loops back to this spot. We go down a hill and up a steep hill. We run out to the turn around and head right back. So we go down the steep hill and up to the aid station. Now we walk and drink. We keep running and I see a 13 year old girl at the top of a hill. I pick it up and pass her on the downhill. That’s pretty cool! It’s flat for a bit and then we come to a hill. My mom says this is the last hill and I charge it. There is a downhill on the other side. My mom says “don’t wait for me, go for it!”. So, I fly down the downhill. We are close to the finish my mom says. I keep running and I feel like I need to go faster to stay ahead of my mom. I go on a small and twisting path. I almost didn’t see the left turn to the finish. I turn and rush into the finish and pass someone on the way. 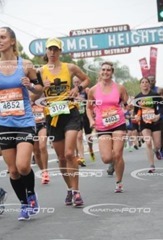 I cross the finish line ahead of my mom. I feel happy! Thank You God! We wake up about 3am to drive down to Pleasanton. 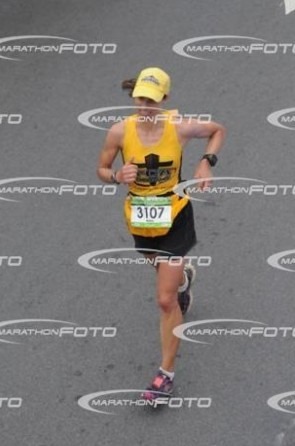 The last time I did this race, I was recovering from broken ribs. It was a great experience even though I had to go slower. However, my bike was actually very good. Today, I’m healthy, but I’ve been working long hours and not able to train much. Like last time, I’ll do the best I can. We arrive and get transition spots together. It’s a full house! An hour early is not going to be enough. Anna is doing her first Sprint Triathlon! We’re so excited, and concerned, for her. Robin is doing the Sprint also but will hang back with Anna to keep her safe. We head to the beach for the FCA Pre-Race prayer which Nick Tuttle announces. There’s 8 of us praying. It’s so great to meet other Christians before the race. And too realize there are others concerns besides my own. The race is starting and the plan was for Anna & Robin to go last. But Anna’s wave is first. Not wanting to cause confusion, I send them off now trailing the first group. Anna has a smile and starts calmly. Hoping it goes well. I have the clear goggles again. Didn’t pack the dark ones. 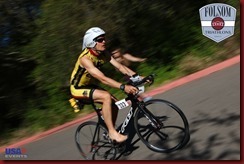 I did learn from the last race and apply slick spray to my wetsuit. I start about 4 rows back. Go! It feels hard but I do my best to stay smooth and efficient. Sighting is really hard with these goggles. I don’t even try to draft, all my focus is just trying to swim. Around the buoy, now I can see better. The water is very warm which is what Anna wanted with her spring suit. But I have to let cool water into my suit sometimes to keep from overheating. This swim feels so long. It’s a good course, though. Finally around the 2nd buoy I can hammer home.. but my hammer doesn’t seem any faster. There is a girl alongside me that I’m trying to pull in front off. She really pushes me. The bottom starts coming into view and I prepare for the exit. 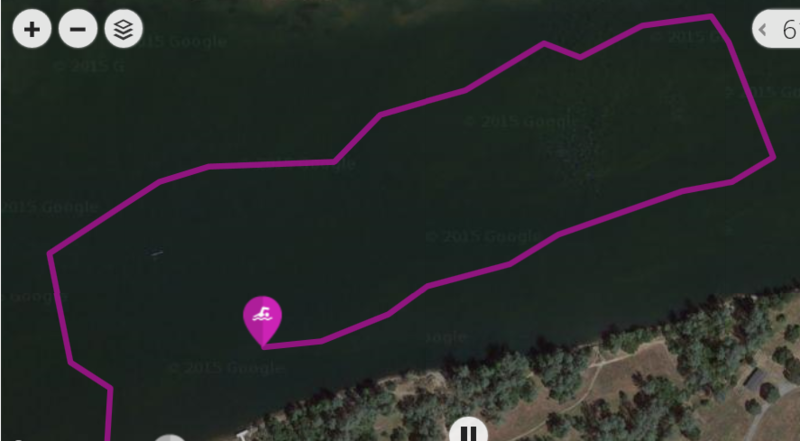 Up, run, goggles, cap, wetsuit off… oops, Garmin is in the way. Back on, Garmin off, wetsuit off. It comes off great with the spray slick! 26:56, about 3 minutes off but to be expected. Grab my bike and go! But I see I don’t have any shoes in the pedals. 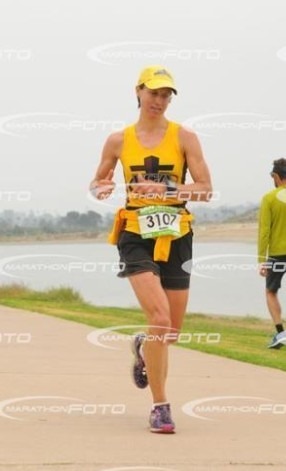 I run back to transition, get my shoes from my bag and head back out. Rookie mistake. Heading out I see the Chavez family, here supporting today. Onto the course I’m excited. There is a long gradual climb which went so well last time I’m looking forward to it. I wonder where Anna & Robin are. When I see a smaller rider way ahead I wonder if it’s them. My form feels better on the bike. Focusing on pressure on the seat and lifting my knees forward. I feel like I’m flying. It’s fun. We go on some new streets, but we eventually get to the road up the canyon. Cool! I keep the same position and it feels great for the gradual climb. I’m passing a lot of people. I wonder if I’ll go faster than last time. Around the turn at the top and now descending, my favorite. However I’m not really feeling the groove on pushing the descent. Onto the big boulevard, we have a whole lane to ourselves. It’s a cool course, both urban and rural. Good roads. Onto the sprint course now, which I used to do a lot when I was starting in ‘92. Great memories. On a climb along the back of the park, there are 5 challenged athletes struggling to get up it. Some are grunting and all are working like crazy. Awesome. So impressed. 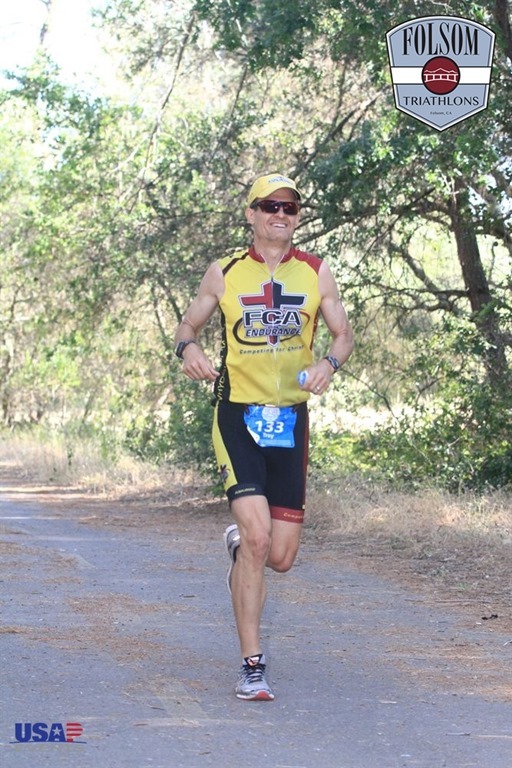 A guy in my age group passes me. Maybe he’s 1st? I pick it up, catch him on a corner and push all the way to the park. He pulls ahead again. Tall. Could be a good runner. Swooping into the park, I have a good dismount into running. But my shoe unclips. Someone says they’ll get it so I keep running to my transition. All the way to the end.. when it starts to look unfamiliar… someone yells, “You’re over here!” It’s Anna! She’s already done and taking her bike out of transition. “Dad, what are you doing? You’re over here, come through here.” This is such a great moment. I was hoping she would get through the race ok and seeing her done is a great joy. Thank you, Lord, for making it great. And then to have her help me in my race, when I’m supposed to be helping her, is funny! 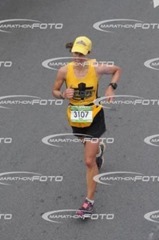 1:05:28, a little faster than the last time. I head out on the run and see Carrie Chavez and think of how I’m trying to run like her husband, Steve. He’s so fast and always smiling. Quick steps, powerful, and having fun. That’s what I’m trying. I have doubts like, “How long can I keep this up with minimal sleep and training?” But I know I have to give God my best and adjust when needed, always staying positive. I get some calf pain, but I don’t let it concern me. Just see if it goes away. The tall guy that passed me is no where to be seen so I must be ahead. But a younger guy passes me and I make a goal to stay with him. Onto the flat bike path my calf feels better. I try to just “fall foward”, getting more speed with same effort. We run right through a pump-track with bike waiting for us to cross before they careen into the jumps. Onto the trails along the levy and creek I think about how much Anna probably like this after running trails in Auburn. 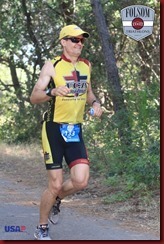 I drink as much water as I can at every aid station. It’s nice and cold. On the descents I try to open up. Down across the river I pass the young guy and then shorten my steps for the climb. Back n forth, I finally pass him for good the next time we drop down across the creek. Along the levy I see our FCA tent in the distance and think I hear Robin & Anna cheering so I wave. I’m pushing well but it’s hard to think of doing this loop again. I come through the finish area to start lap #2. The announcer cheers me through. I see Carrie Chavez again and say, “Do I look like Steve yet?” She says, “Yes, you do!” That’s motivation. Ok, I can do this lap again. On the 2nd lap I do everything the same. Falling forward. Pump track. Push the descents. The tiredness really sinks in with 1/2 mi to go. But the finish line is there and it’s great to be done! 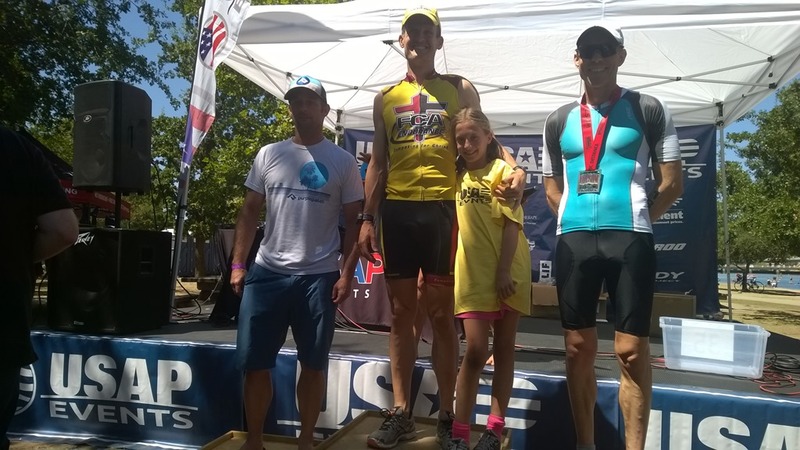 42:32, about a minute slower than Folsom Tri but better than expected. Thank you, Lord, for a super fun, exciting race. Even though I came into it unprepared and slower, you make it so much fun, protecting me as I push myself beyond the comfort zone. 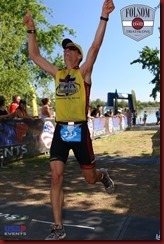 After doing the difficult Olympic distance Auburn Triathlon, I’m looking forward to a flatter, faster Folsom Triathlon. 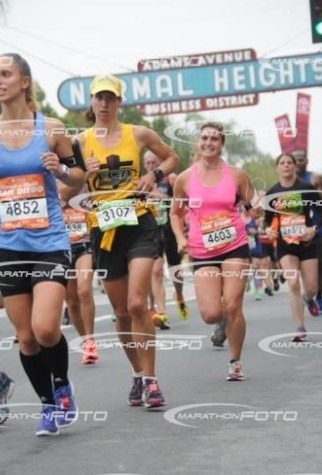 But more than that, I’m preoccupied with thinking about Robin’s Rock-n-Roll Marathon which she will be starting about the same time! After the girls and I jump in the car at 5am we get to talk with Robin on the phone as she is being dropped off at her start by her parents. We get to pray for her race. I wish I was there to support her. But she has the Lord and hopefully I can help some athletes at my triathlon this morning remember that they, too, have the Lord with them. Racing under FCA Endurance has been so rewarding, being encouraged and being able to encourage others through Christ. Our girls are so helpful in moving FCA gear when we arrive. Also, they are volunteering at the athlete’s food tent today. Very proud of them. I set up my transition, get a little run in and we make our way to the start for the FCA pre-race prayer. Race announcer Nick Tuttle lets everybody know. About 8 of us join together in prayer. Some have concerns about the swim. Some just want to give God their appreciation and their race before the huge effort before them. I want to be focused on Him throughout the race because I realize the risks of injury, frustration or self-centeredness and I want to be on guard against them. A few people pray, including my daughter Anna. There’s so much to do before a triathlon, but this always feels the most beneficial. TeamMate, Flor Hodges, is here and will be exciting to watch. Her husband, coach, and my good friend, Rob Hodges, is here volunteering. He tells me there’s a pastor here doing his first triathlon and that he knows Pastor Lincoln Murdoch. I’m hoping to meet him and also think about how much I’ve learned from Lincoln. 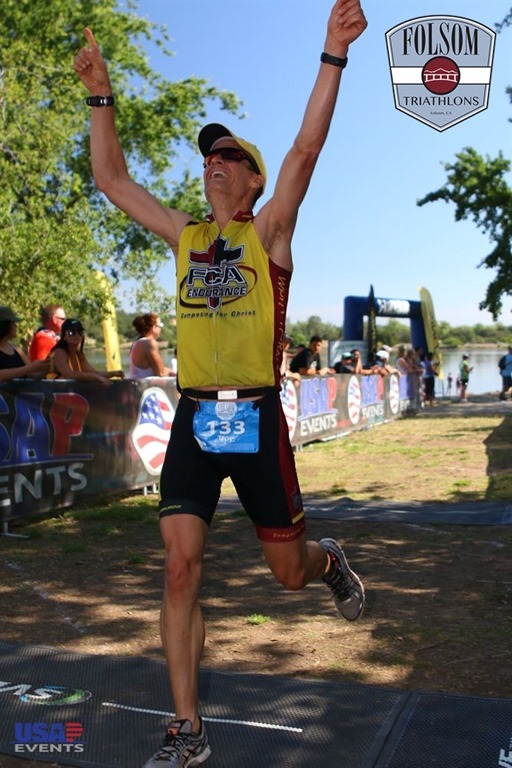 He is an exciting pastor and triathlete from Omaha, Nebraska. If you ever get a chance to hear him, you’ll never forget it! Here’s a recent interview he did. I jump in without much warm-up. The water is cold in Lake Natomas. The sun is directly at us for the 1st 500 yds. By mistake, I have clear goggles. It’s so bright it hurts to look. But, as long as there is sun shining at me, I should be going the right direction. I start a few rows back this time which is more my speed. Go! As we go, I notice an underwater cable stretched the length of the course for the rowing races they have here. That’s great! But does it go the same direction as the course.. as the sun? I’m hesitant to rely on it even though it sure is comfortable to just swim with my head down. I imagine swimming right past the turn bouy. But I do see the buoy and boy is it great to swim a different direction. The water is clear and brisk.. actually very cold in spots. It’s a great day for a race! Coming back I find a guy slightly faster to draft behind. Even though he swims off course a few times I set myself to go wherever he goes. (Later I see my Garmin path shows the zig-zags of this section). My swim was good. But my transition isn’t. I get hung up on my wetsuit. Need to start using the spray slick again so I don’t give up time. Despite the hang-up, I actually get out before the guy ahead of me (and am in 3rd). Being on the bike always feels good when you start. Over the highway, down Folsom Blvd, and up into the more rural roads. I’m pushing hard, breathing hard, drinking a lot, trying to be smart and give my best effort to the Lord. I encourage others. After 8 miles I see a familiar bike.. it’s Sena Minshew on her green machine. She’s always smiling. Then I see a familiar kit. it’s Elise Winter from the Freeplay team. She’s a good rider so I’m glad to have caught her. We encourage each other as I go by. There’s not much wind. About 13 miles I pass a guy in my age group (and move into 2nd). We’re on an out-n-back which is great to see other racers. I see Flor coming back and cheer for her. I turn and then see Elise behind me. We go onto the canal bike trail. A guy in a different age passes me. I try to pick it up to keep him in sight. I’m staying with him and really working hard. We go through the tunnel with the bump and then onto familiar American River Bike Trail. I pass a rider while coming into the park. At that moment I think, “This might be a no-passing zone..” Next thing I realize I’m going the wrong way and have to turn-around. As the guy I passed moves back ahead I have a feeling that’s the way it’s supposed to be. (Later found out it was a no passing zone). I come in with a good dismount into running and rack my bike quickly. Heading out, our friend, Dave Campbell, who has finished his Aquathlon race, yells to me to try to match his time of 40 min on the run. It’s great to get a challenge like that. Even though I don’t think I can beat him, I’m going to try my best now to get close to 40min! Rob Hodges is working the run course and cheers me on. My achilles is feeling good. Thank you, Lord! My legs are stiff but should loosen up soon. I try to run really smart, anticipating the turns and inclines of the trail. The wooden bridge.. can’t wait to get back to it. It’s warming up. I drink water at each aid station. I eat 2 Hammer Gels along the way. 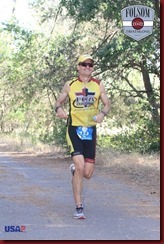 I pass a guy in my age group at about 2 miles (and move into 1st). I start seeing the Every Man Jack racers already coming back. Wow, they are so fast! I don’t know what place I’m in and just figure with those guys I probably won’t place at all but that it doesn’t matter because I feel like I’ve really raced well today for the Lord and am just excited about performing well. Finally, the turn-around. I’m tired but know it’s slightly down hill and I’ve got to keep the speed up. My pace is good, hopefully will be under 42 min. I cheer for Elise again. With a couple miles to go I think about our track workout where we practiced Surging and Settling. I better try it out. At the wooden bridge, despite being pooped, I surge all the way across and then settle back into pace. It hurt but felt rewarding. 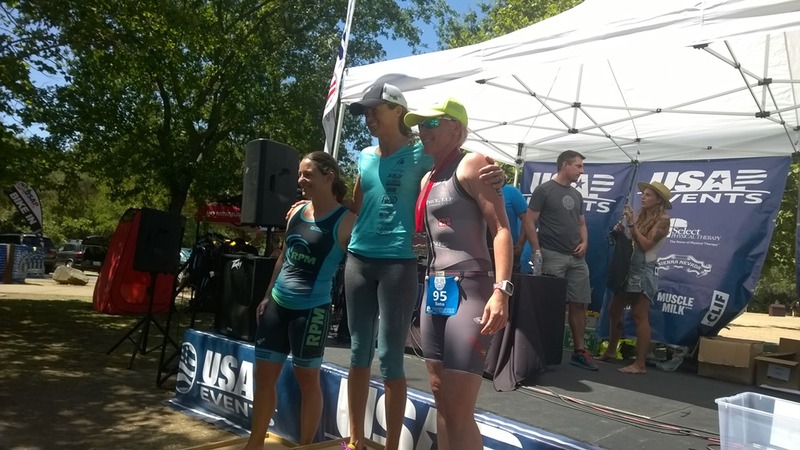 I chase down another guy before the main finish area and finish very happy with my race. Thank you, Lord. Run was 41:34. 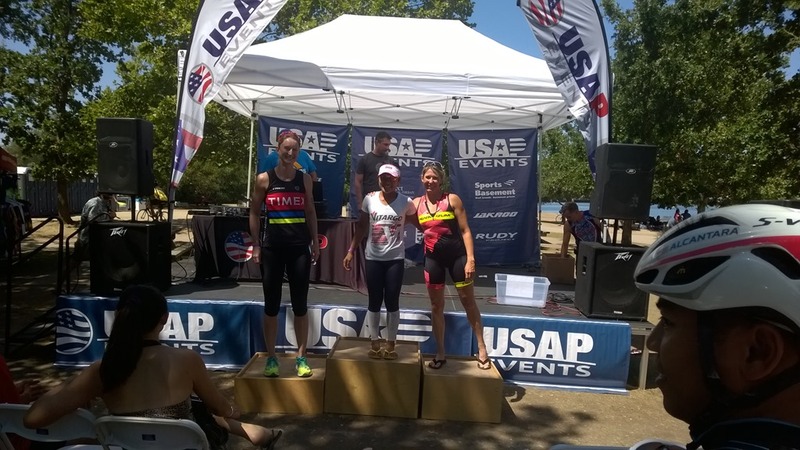 Was surprised to finish 1st in my age. 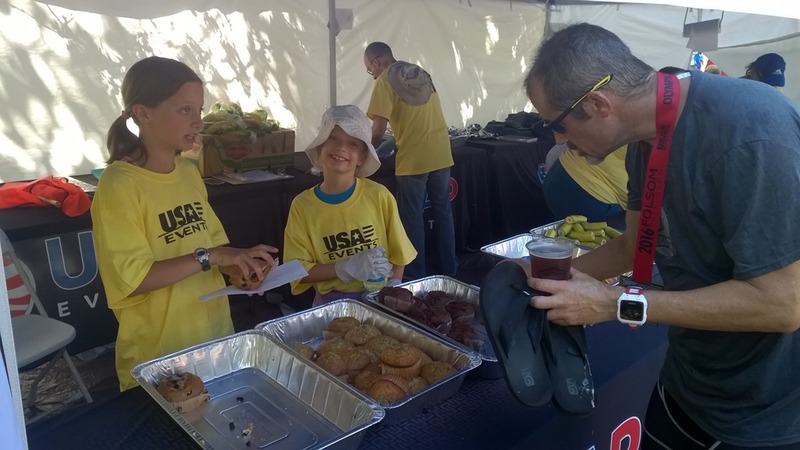 Anna and Ariel did so well in the food tent, kindly preparing plates of post-race nourishment for the athletes. Ryan Coehlo puts on a great race, and creates a great atmosphere. You can tell it is a passon of his. Announcer Rick Tuttle is awesome and seems to know everyone. 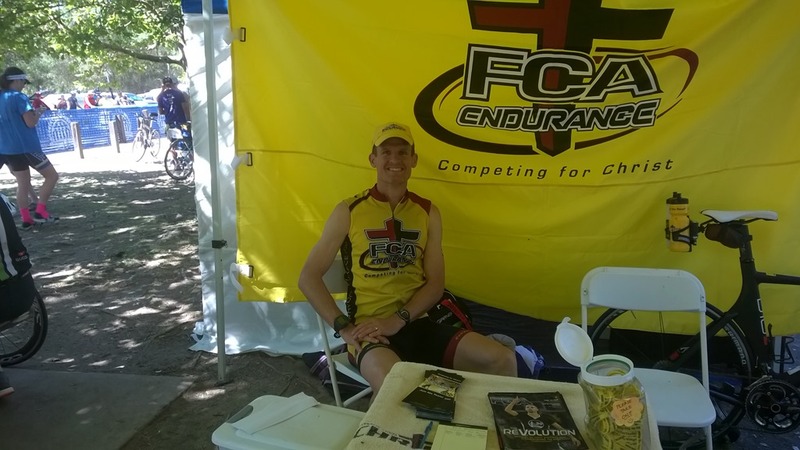 I loved talking with some athletes at the FCA Endurance tent. 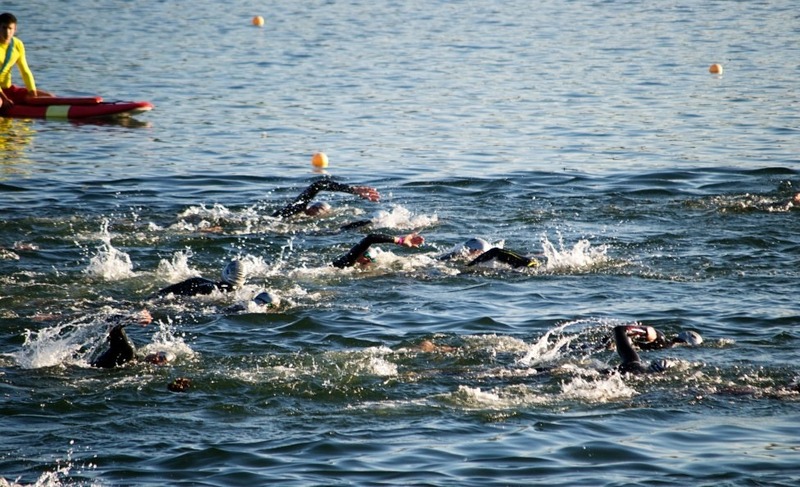 So many people are trying out the challenge of triathlon. Some have to borrow bikes. It doesn’t matter what gear you have or how much you know. It seems to be a race against oneself in many instances. It’s great to see people challenging themselves. I think it’s the biggest challenge we face. I know I couldn’t do it without the Lord Jesus in my life.